If you're planning a gap year abroad then one thing you'll most certainly need is a passport. In fact, your entire trip will depend upon it. A passport is a type of document, issued by a government to a citizen, which allows him or her to enter foreign countries and re-enter his or her own country. A passport is also a useful identification document as it includes a picture. When abroad, a passport also helps to identify the bearer as a citizen of a particular country, and holds entry visas which may be required by other governments. UK passports are issued by the Identity and Passport Service (IPS) of the Home Office. British citizens are eligible to hold a British passport. When it comes to passports, citizenship may be from being born in the UK or a naturalised citizen, though it might also come from being transmitted by a British mother (for those born on or after 1 January, 1983). There are a number of other people who might be entitled to a British passport, including British overseas citizens, British subjects, British nationals (overseas), and British protected persons but all of these categories have to do with people associated with former British colonies or territories. People who marry British citizens or enter into civil partnerships with UK citizens are not automatically eligible for British citizenship/a passport. The UK Border Authority is the agency which oversees citizenship and therefore passport eligibility. British citizens 16 years of age and older who never had a child passport can apply for an adult passport. Applications should be made at least 6 weeks prior to intended travel, and application forms can be obtained from the IPS or a Post Office branch which offers Passport Check and Send services. This form can also be completed online. In addition to this form, you will also need to provide a picture of yourself which meets passport standards and pay a £77.50 fee. You will need to provide original documents proving your citizenship as well as complete an interview with the IPS. If you are 16 years of age or older and did have a child passport, you can continue to travel with this document until it expires and then renew your passport as an adult passport. You can renew an adult passport, or a child's passport into an adult passport, as long as your name or national status remains unchanged and the passport is undamaged. You may renew your passport any time, but only nine months extra months can be carried over and added to your new passport. 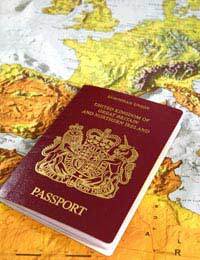 Most passport renewals take an average of three weeks to complete, though this is not guaranteed, and costs £77.50. IPS also offers a Fast Track one-week service (£112.50) and Premium one day service (£129.50) for those whose travel is imminent. Application forms can be obtained from the IPS or from the Post Office's Check and Send service. Applications can also be completed online. Stolen passports should be reported to the police, and lost or stolen passports should be reported to the IPS via an LS01 Form (available from the IPS, a Regional Passport Office, the police or the Post Office's Check and Send service). To replace a lost, stolen or damaged passport you will need to complete the standard application form, submit your damaged passport and provide supporting documents as requested. The cost of replacing a passport is £77.50 for standard service, £122.50 for one week (Fast Track) service and £129.50 for one day (Premium) service. If you are overseas and your passport is lost or stolen you should report this to local police. Contact the British embassy, consulate or high commission in the country and obtain an LS01 Form so that it can be sent back to the IPS and your lost, damaged or stolen passport cancelled. The Foreign and Commonwealth Office will issue travel documents so that you can return to the UK where you can apply for a replacement passport. A passport is a vital travel document without which a gap year abroad will be almost impossible. If you are planning a gap year, don't delay in applying for an adult passport or finding out if you need to renew or replace an existing passport.